We are experienced scrap brokers that deal in manganese steel. Our brokers have built relationships with buyers who are looking for manganese steel scrap and other hard to find materials. Let us do the work of finding a buyer for you. We work with our suppliers to help them sell scrap manganese at the best price possible. If you are looking to buy or sell manganese steel, give us a call. When equipment made from manganese steel wears out it becomes a very valuable scrap material, however it can be difficult to find a buyer because it is hard to transport and process. Manganese steel, even though it is listed under a ferrous grade, it is basically non-magnetic. You cannot load it with a magnet—you have to use a grapple or another type of mechanical loader. 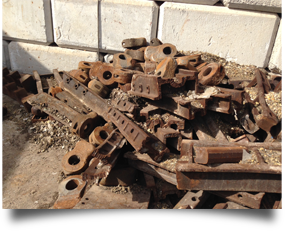 We will not only broker the sale, but we will also handle the arrangements for the pick up and transport of your load of scrap manganese steel. The price of scrap manganese steel varies based on market conditions and grade. Give one of our scrap metal brokers a call for today’s prices whether you are looking to buy or sell manganese scrap. We are based in Florida but we trade scrap manganese and other materials throughout the US and export worldwide. We will work with you, whether you are buying or selling, to negotiate a fair price for your manganese scrap.